This George Armstrong painting of a late Middle Archaic base camp at the Koster site illustrates human use of animals for many purposes. Look closely at the painting and list some of the ways that humans are making use of animals. Image used with permission of the Center for American Archeology. Availability of natural resources, cultural traditions and practices, and choice all influence human interactions with animals. Archaic Period peoples used a variety of techniques to hunt and collect animals as sources of food and raw materials. They may have managed some animal populations, and they had domestic dogs. Human interactions with animals went beyond the food quest. Some animals may have been symbols of connections or relationships with other people. During the Archaic Period, some tools and ornaments made from animal parts were exchanged across great distances. Archaic Period people had special relationships with some animals. Animals were likely central to some religious beliefs and practices. In this section, we explore the various ways that humans interacted with and used animals during the Archaic Period. 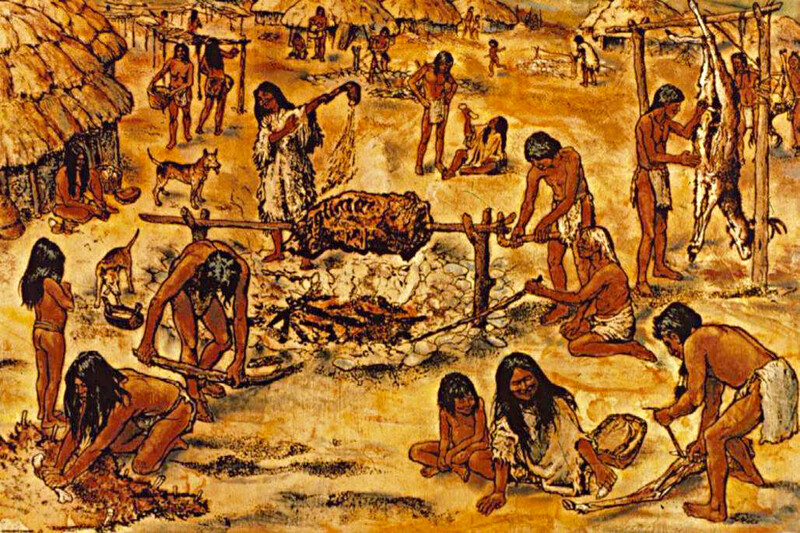 Interactions with animals influenced where people chose to live and other cultural practices. Understanding human use of animals provides clues to important cultural and social issues, such as diet and health, settlement patterns, economy, technology, exchange, socio-political organization, and religion.